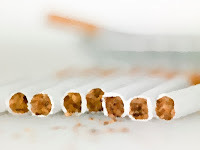 The first drug that children and teenagers typically use is nicotine in one form or another. Health officials work hard to find ways to stop kids from ever picking up cigarettes or any tobacco products. Policies that ban tobacco-product displays at the point of sale may help reduce teen smoking, according to a new study. 1,200 teens who were smokers, or considered to be likely smokers, participated in the study. The teens “shopped” in a virtual convenience store, some of the stores had cigarette products visible, while in others they were hidden. Some of the stores had tobacco ads present, while in others they were either hidden or banned altogether. The teens were told to buy one drink, one snack, and two additional items at check-out, with no restrictions on what they could purchase. Teens shopping in stores with hidden tobacco products were also much less likely to try to buy those products, HealthDay reports. Banning tobacco ads had minimal impact on the teens’ decision about whether to buy cigarettes. The study found 9 percent of teens who shopped in stores with hidden tobacco displays bought cigarettes, compared with more than 24 percent of those shopping in stores that openly displayed them.